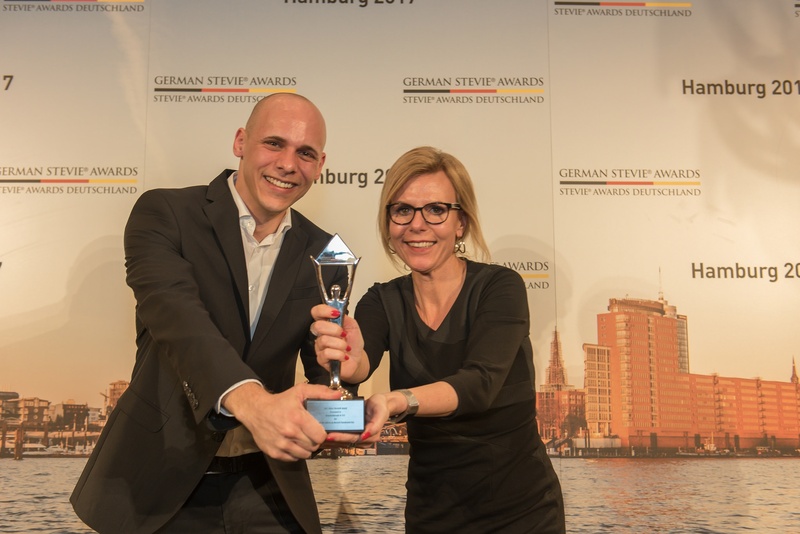 The third annual German Stevie Awards were celebrated at the Fairmont Hotel Vier Jahreszeiten in Hamburg on Friday, March 31. 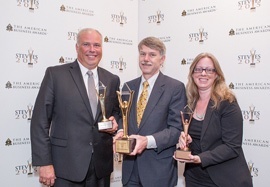 President and Founder of the Stevie Awards, Michael Gallagher, handed out the gold, silver and bronze Stevie Awards to winners from across Germany. 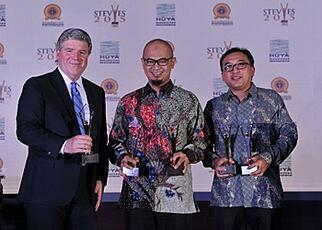 Highly-ranking representatives from more than 50 winners received their awards on stage. In their third year, the German Stevie Awards have already established a leading role in Germany. They are part of the Stevie Awards programs, which are widely considered to be the world's premier business awards, conferring recognition for achievement in the workplace in programs such as The International Business Awards for more than a decade. All organizations in Germany were eligible to submit nominations. The highlight of the evening was the presentation of the Grand Stevie Award to the communications agency Weber Shandwick Germany. The PR agency, headquartered in Munich, Berlin, and Frankfurt has won German Stevie Awards for three consecutive years. This year they won two Gold, two Silver, and one Bronze Stevie Award. Because of these successes, Weber Shandwick earned the most points out of any other organization and recieved the Grand Stevie Award, the top honor. Winners were selected in variety award categories, ranging from best companies of the year to best customer service and HR solutions, to new products and marketing campaigns. There were many categories for creative minds such as best videos, company-related e-books, and apps or websites. "The quality of the nominations this year was just outstanding," said Michael Gallagher. He was delighted to meet many of the winners in Hamburg at the awards gala. At the end of the award ceremony, some exciting news about the German Stevie Awards 2018 was announced. The big surprise: This coming year, the 4th annual German Stevie Awards will not have any entry fees. "We want to give all companies the opportunity to participate in the German Stevie Awards," explains Michael Gallagher. "This is why we are completely waiving the entry fees for the 4th German Stevie Awards." The award ceremony will then take place on April 13, 2018 in Berlin. Nominations for the 2018 German Stevie Awards starts on September 6, 2017. Request your entry kit for 2018 here. The Stevie® Awards today announced Grand Stevie Award winners in The 14th Annual American Business Awards competition. Winners will be presented with their Grand Stevie trophies at the ABAs’ gala banquet on June 20 in New York. CallidusCloud, the Dublin, CA based software developer, received the Grand Stevie for organization of the year, for earning the most award points (76) in The 2016 American Business Awards. Ot her top ABA Grand Stevie winners include TopSpot Internet Marketing (Houston, TX) for interactive agency of the year (17 points), Merkle (Columbia, MD) for marketing agency of the year (16), and MWW (East Rutherford, NJ) for public relations agency of the year (17.5). This is the fourth year in a row that MWW has won this award. 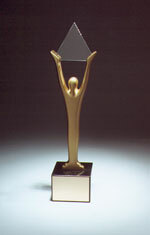 The Grand Stevie Awards were granted to the organizations that submitted the best body of entries to The American Business Awards this year, in their own name or in the names of one or more clients, with a Gold Stevie Award win counting for three points, a Silver Stevie win for two points, and a Bronze Stevie win counting for 1.5 points. The organizations with the most points won. The American Business Awards honor an all-inclusive spectrum of American business people and organizations -- from non-profits, emerging start-ups, major public companies and government agencies, to corner-office executives, product developers, marketers and web development teams. More than 3,400 entries were submitted to The 2016 American Business Awards and more than 250 executives nationwide participated in judging. Stevie Awards are conferred in five levels of distinction: Grand, Gold, Silver, Bronze, and People’s Choice. More than 400 executives and their guests are expected to attend the June 20 awards gala at New York’s Marriott Marquis Hotel. For a complete list of all 2016 American Business Awards’ Stevie Award winners visit http://www.StevieAwards.com/ABA.